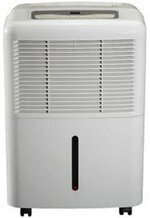 The Sunpentown 40 Pint Dehumidifier (SD-40E) is a medium capacity model suitable for a room with an area of up to 275 sq ft (manufacturer's recommendation). This Energy Star qualified unit is capable of extracting 40 pints per day and the use of more efficient refrigeration coils, compressor, and fan enables it to do so while consuming between 10 and 20% less energy than most other models of comparable capacity. An important contribution to energy saving is an adjustable humidistat. This device measures the relative humidity in the air around it and cycles the unit on and off to maintain the moisture level you have pre-set. The humidistat installed in the Sunpentown 40 Pint Dehumidifier can be set, in 5% increments, at any level between 35% and 80% relative humidity, covering the complete range that anyone is likely to want. The energy saving arises because it operates only when required rather than operating continuously, although continuous operation is an option if you need it. Most people choose a level of relative humidity between 45 and 55%. Any level between 30% and 70% is comfortable for most people although the lower half of this range will make it "feel" a little cooler. Below 60% will be sufficient to protect your belongings and your home against moisture damage and mold growth while 50% and below will have the added benefit of making your home unattractive to dust mites which can aggravate allergic reactions. It is inadvisable to go below 40% in the furnished areas of your home as some materials, particularly wood and leather, can be degraded if the air is dried much below 40%. Water collected from the air is drained into an 11 pint water collection container, or bucket, which will require emptying by hand. The task is made a little easier by the handle on the bucket, a refinement which some other manufacturers would do well to copy. This chore may be one you would rather avoid and the Sunpentown 40 Pint Dehumidifier is designed to allow continuous drainage if required. By attaching a small plastic hose to the discharge port water can be drained as it is collected by means of a gravity feed. If a drain or other nearby outlet is not available on the same floor level a separate condensate pump will have to be purchased which can pump the water to the next floor level if required. You may wish to move your appliance from one room to another from time to time and the Sunpentown 40 Pint Dehumidifier is a portable unit which can be relocated with relative ease. Caster wheels on the base allow easy movements across the floor and a retractable carrying handle is provided for other movements. At a weight of 33lb it might challenge a small child but any reasonably fit teenager or adult should not find this too strenuous. The SD-40E is rated as being capable of operation at temperatures as low as 41° but it is not equipped with auto-defrost so would be less than ideal in areas which remain at cooler temperatures for long periods, such as many basements. While it would not be ineffective there are alternatives better suited for this type of location. The Sunpentown 40 Pint Dehumidifier also includes auto-restart to reactivate the machine following a power outage, a washable air filter, electronic controls for ease of use and two fan speeds so that if faster drying is needed the higher setting may be selected.